Wednesday night, WWE star, John Cena hosted the ESPY awards. The ESPY’s are awarded based on fan voting and have become a star studded event. To no one’s surprise, LeBron James and the Cleveland Cavaliers swept the show. 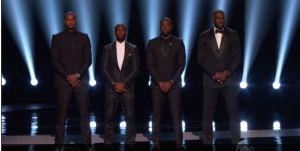 LeBron won 5 ESPY’s including best male athlete and best NBA player and his Cavs won best team. The Warriors’ Steph Curry won as well with an award for best record-breaking performance (breaking his own record for most 3-pointers). The biggest honor of the evening went to TNT analyst Craig Sager who was awarded the Jimmy V Perseverance Award for his courageous fight against Leukemia. Host John Cena followed up the emotional plea with an entertaining opening monologue roasting the athletes, the coaches and the owners. Deflategate won’t go away and Tom Brady looks like he won’t be playing at the start of the season. As you may recall, the New England Patriots QB Tom Brady was suspended 4 games by NFL Commissioner Roger Goodell for his participation in a scheme to deflate footballs (which makes them easier to grip) during a 2015 playoff game. Brady and the NFL Players Association appealed the suspension but the Court of Appeals denied the appeal. Brady’s only hope now is to take his case all the way to the Supreme Court. As of now, it looks like Brady’s replacement, Jimmy Garoppolo will be quarterbacking the team for their opener on September 11th.